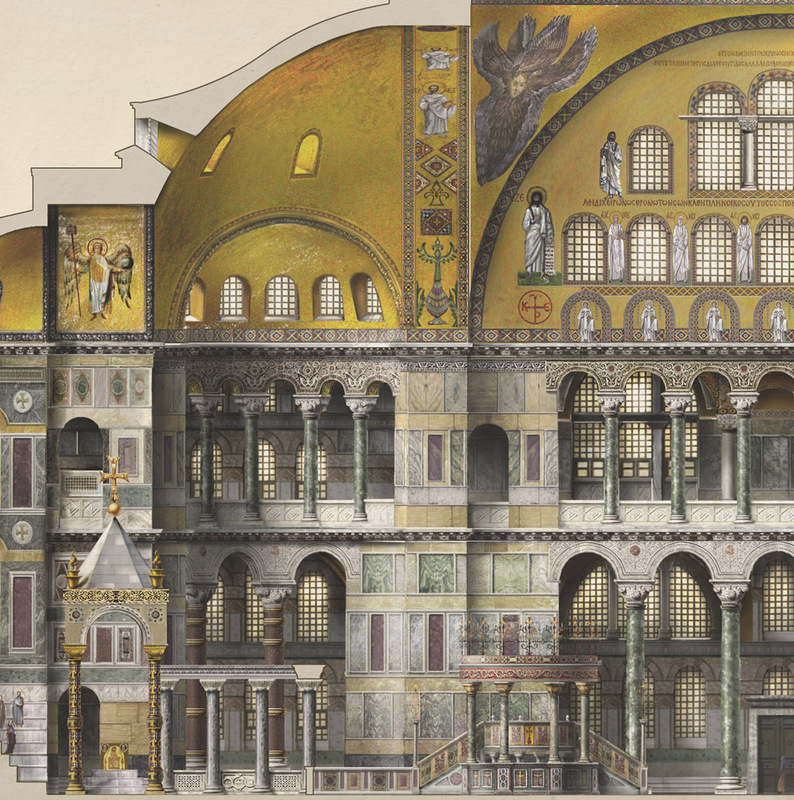 Above is a beautiful reconstruction of Hagia Sophia as a church. The mosaics in the bema arch were added in the 14th century following repairs after an earthquake in late 1343. This is how it would have looked in its last days as a church. The south gallery is straight ahead on the second floor of the church. That is where the Deesis mosaic is. The image above is another of the first color pictures taken after the restoration was complete in the late 1930's. When Hagia Sophia functioned as a church, the South Gallery was reserved for the emperor and his family, courtiers, servants and guards. They all would have been splendidly dressed in silks, velvets and other fine materials. 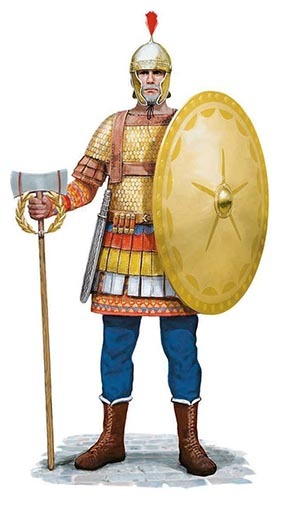 The soldiers - in later times bearded Viking and Englishmen - were dressed to the hilt in their Imperial military uniforms, carrying splendid swords and shields, and wearing gilded and silvered polished armor set with gold enamel that glinted as they moved. Since this was a church their helmets would have been removed and stored for them. The same was true for the members of the Imperial family here in the gallery, no hats or crowns were worn and the women were modestly veiled. The galleries of Hagia Sophia could accommodate thousands of people and were especially crowded on feast days and for special services or ceremonies. At times, naturally at night and in the early morning, the gallery was virtually deserted except for a few clergy or bored guards. Hagia Sophia had a huge maintenance staff that cleaned it and kept the lamps filled with oil and lit. The altar was washed with rose water by clergy everyday. There was also a fire brigade assigned to the church on 24 hour watch. The central and eastern sections of the south gallery were walled off with a ornately carved marble partition that still has its original 6th century wooden beams along its top. From its great height and exceptional position, the south gallery was the supreme vantage point in the church, with a complete view over the nave and the the altar area. During the liturgy communion would have been brought to gallery and served to the worshipers there. One could enter the gallery directly from the Great Palace without having to pass through the nave of Hagia Sophia. Outside there was a private elevated covered passageway - the Anabasion of the Chalkê - from the palace that ended at an external wooden spiral staircase. The passageway was really cool, it had windows you could open and look out of and see people in the streets and squares below. They could see you, too. It was even possible to address crowds of people below. The spiral stairs are long gone, but the portal remains. There are inscriptions scratched into the marble door surround on both the inside and the outside that are over a thousand years old, and in different languages. Hagia Sophia is full of ancient graffiti - hundreds have been recorded - including FOUR Viking boats! The South Gallery was brightly lit by natural light during the day. Sunlight would spill over the balustrade into the nave below. The walls and ceilings were covered with gold glass mosaic which reflected and bounced light around gallery like an inner sun. In Justinian's time the vaults were covered with ornamental mosaics set in plain gold backgrounds. Later some of these were replaced with mosaics of saints, Christ and angels. In one vault was a scene of Pentecost, with fiery tongues of light descending onto the heads of the Apostles from the Holy Spirit. There were also gigantic Cherubim and Seraphim surrounding a Christ Pantokrator, which was set in a great circular medallion in the center of the vault. The huge windows have marble frames that were set originally with panes of clear greenish glass, then plaster squares set with round glasses during Ottoman times, and now back to glass panels. The gallery was even more beautiful at night when it was lit by candles and oil lamps. There were great silver candelabra hanging from the ceiling and single oversized glass lamps in groups of three suspended from cross-rods in the arcade arches. The candelabra were also set with glass cups that held burning lamp oil. There were also big silver candle stands in front of the icons and mosaic panels on the walls. There is a special property in semi-transparent gold glass mosaic that is especially effective in reflecting lamp and candle light. The glass cubes were set at angles and in patterns to magnify this effect. Evening and night vigil and vespers services in Hagia Sophia were unforgettable events. At twilight and then at night the air would smoulder with flickering light. The oil in the lamps was fragranced which added to the sensual experience. The chanting, voices of priests and deacons and the voices of the choirs reverberating from the walls and vaults added sound to the sensational overload. Now we can only imagine this lost and mysterious splendor which contrasts so dramatically with in the cold bright light and hordes of tourists we see today. This area of the south gallery (seen above) was also a location for assembly of the Patriarchate, the offices of which climbed up the side of Hagia Sophia, filling the space between the church and the great square of the Augusteum. Connected with the second floor here on the south side of the Church, remains of the Patriarchal offices still exist. On the right hand side of the entrance to the church is a beautiful room now called the “Baptistery” that was actually the main Patriarchal reception room. Other rooms survive in the walls and passages on this side of Hagia Sophia, but they are not open to the public so few see or know much about them. This area of Hagia Sophia is particularly bright and spacious because of the huge windows and the fact that the facade here is unobstructed. A significant part of the original marble revetment has been saved here. The picture above shows a wood scaffold erected so the restorers could examine the area where they hoped they would find the Deesis mosaic. Prior to the restorers arriving to hunt for mosaics workers had opened up a part of the panel to examine the cracks there. In doing so they destroyed half of the figure of John the Baptist! 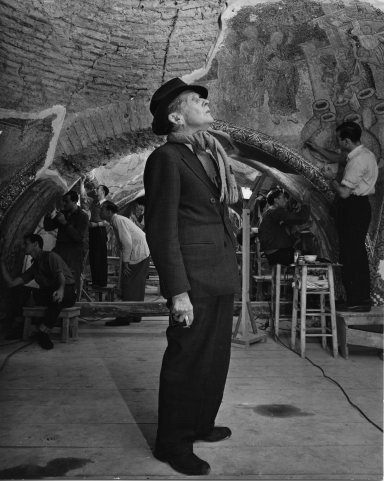 In December of 1931, Thomas Whittemore led a team of archeologists, historians, craftsmen and restorers from the Byzantine Institute of America to Istanbul in order to do a complete survey of the church of Hagia Sophia. Recently converted to a museum after use as a mosque for almost 500 years, the Institute had the complete support of the Turkish government. This scientific expedition was, in fact, a kind of treasure hunt; using a map left by a pair of Swiss architects who had worked in Hagia Sophia almost 100 years before, the team was using their notes to find Byzantine art that had been lost for almost half a millennium. 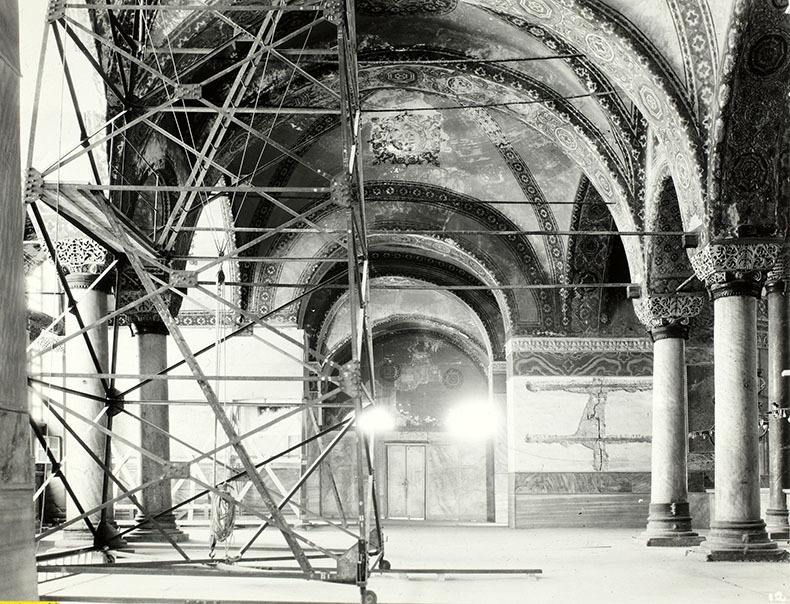 The Fossati brothers, Gaspare and Giuseppi, in their 1849 restoration and redecoration of the mosque, discovered, sketched, and re-concealed several major works of Byzantine art. 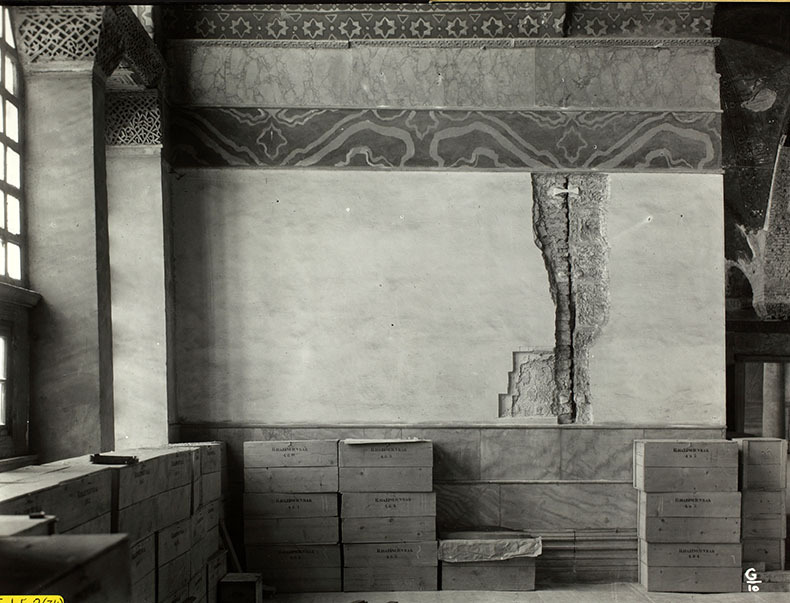 The Institute had the brothers’ sketched reconstructions, and ideas about where the works might be located, but only had the vaguest hope to find them – Hagia Sophia had sustained massive damage in an 1894 earthquake, and there was no guarantee that the works remained. Whittemore, however, was undeterred and began examining a wall in the eastern part of the upper south gallery, quickly striking gold. The team had found what they were looking for. In 1933, the space above this marble revetment and the vaults were plastered over and painted. When Thomas Whittemore and his team arrived to begin work they found a thousand cases of documents from the Hagia Sophia mosque archives pushed up against the walls. They had recently been moved from the room over the Vestibule at the far south side of the western gallery. (I have a page on this room that you can see in the More Mosaics section). The first incision into the plaster took place on July 14, 1934. The first season of work took four months and ended in late November of the same year. The uncovering of this mosaic panel was the first step - further conservation, consolidation and study lasted through seasons of work in 1936, 1937, and 1938. It was a slow and deliberate effort. As the team uncovered the mosaic, they realized that were unveiling a work of art of world significance - this filled them with awe, and made them even more cautious in their excavation and conservation. While they were working there were rumors in the outside world that something amazing was being uncovered, but the work area remained sealed to the public and only specialists, Turkish government officials and museum workers had the privilege of seeing what was being uncovered. Muslims and Christians alike were amazed by the Deesis panel and recognized this was a significant discovery of global interest. The pictures that somehow got out caused quite a sensation in the press. The lost world of Byzantium was a story that fascinated people. Hagia Sophia was one of the most famous buildings in the world - one of the seven modern wonders, a miraculous survivor of earthquakes, religious conflicts and conquering armies. When the Deesis panel was uncovered it was an embodiment of many things at once: the history of the building, a spirit of suffering, humanity and Heaven - all in one. It was of such extraordinary quality and beauty that it was immediately hailed as one of the greatest treasures of world art and still is today. These files were stacked up in front of the mosaic, which the team had to return each year in season to work on it. What a horror to see the damage done to the panel. The Deesis panel is 5.95m (19.5 ft) wide and 4.08m (13.5 ft) tall. The Byzantine Institute recorded everything with clear photos and copious notes so we are able to see exactly what happened in their journals. Below we can see the state of the mosaic midway through cleaning and consolidation. The painted plaster decoration above the panel was meant to imitate marble revetment is a 19th century restoration. The marble vine-leaf cornice above it is from the time of Justinian. There were two courses of Proconnesian marble at the bottom. The lower course was part of the original decoration of Hagia Sophia and the second, upper one was added to frame the mosaic panel. At some point after the mosaic was created, in the Byzantine period, this row of unmatched marble panels was put up to hide damage along the bottom of the mosaic. Look at that crack in the wall to the right. 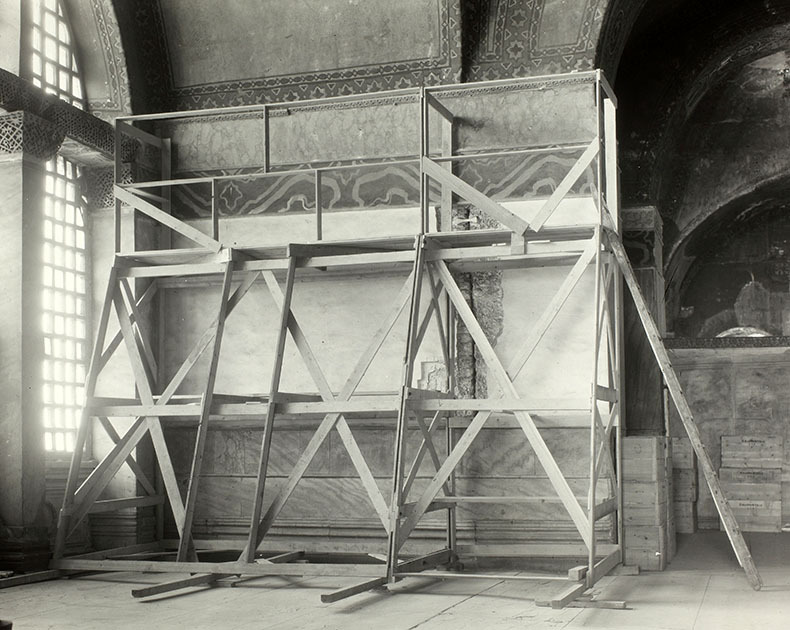 In 1910, Sultan Mehmet V set up a commission of specialists to examine the fabric of Hagia Sophia. This cut was made to expose the line of junction between the brick and stone of the pier. They inserted glass epies to detect any settlement in the building. Unfortunately, a part of the mosaic was damaged in this process. Above another picture showing a step in the process of the restoration - what a mess. It shows you how difficult a job of conservation it was. From 1847 through 1849 a complete renovation of the mosque of Hagia Sophia was conducted by Giuseppe and Gaspare Fossati at the command of Sultan Abdul-Medjit. During this renovation they discovered the Deesis panel and made a rudimentary watercolor record of it. During their work they made large repairs to parts of the plaster here. Finding the mosaic was in a perilous state and about to detach from the wall, they had little time to fix it and worked fast. In great haste to save the mosaic from dropping off the wall in front of their very eyes, they drove rough hand-wrought iron nails right into the panel and along the top to hold it up. That was invasive, but the technique saved the panel. Above you can see the restorers with their tools - working on the bema Angel. Even though they had uncovered and recorded the mosaics at the express command of the Sultan, the intention was always to cover them again, since the building was a mosque and intended for Islamic use which prohibits representational imagery. First, they smeared a size over the mosaic tesserae that was extremely difficult to remove during the restoration, requiring dental tools and carborundum to get it off. Then the Fossatis covered the panel with several layers of plaster, increasing the depth from right to left to correct the slant of the wall. Finally the Italo-Swiss architects painted two horizontal bands imitating red and Proconnesian marble panels over the area to make it blend it with the rest of their decoration of the mosque. The watercolor sketch made by the Fossatis showed that in its outlines and masses the mosaic had not undergone serious material change since 1849. This was not true of the mosaic vaults of the South Gallery, however, which had fallen in the great earthquake of 1894 and were lost forever. For another four years, work continued on the uncovering of the mosaic by Thomas Whittemore and his assistants. As mentioned above, although the actual removal of plaster took only one year, further seasons of work were needed to consolidate and restore the mosaic. The team from the Byzantine Institute was meticulous in its mission and made detailed written and photographic records of all of their work. They were learning as they worked, carefully considering and reviewing each restoration technique used, and each decision before it was implemented. Black and white as well as color movies were also made. That's Thomas Whittemore on the left, working in the Kariye Djami. All of the Fossati iron nails, which had become badly corroded, were extracted - one by one - and replaced with cramps of 'Delta' metal. Thin copper wires, now invisible, were used where necessary to secure the plaster bed and the mosaic. For complete security, the remnant of each figure as a whole was framed with larger copper wires and a mixture of plaster mixed with crushed Byzantine brick. 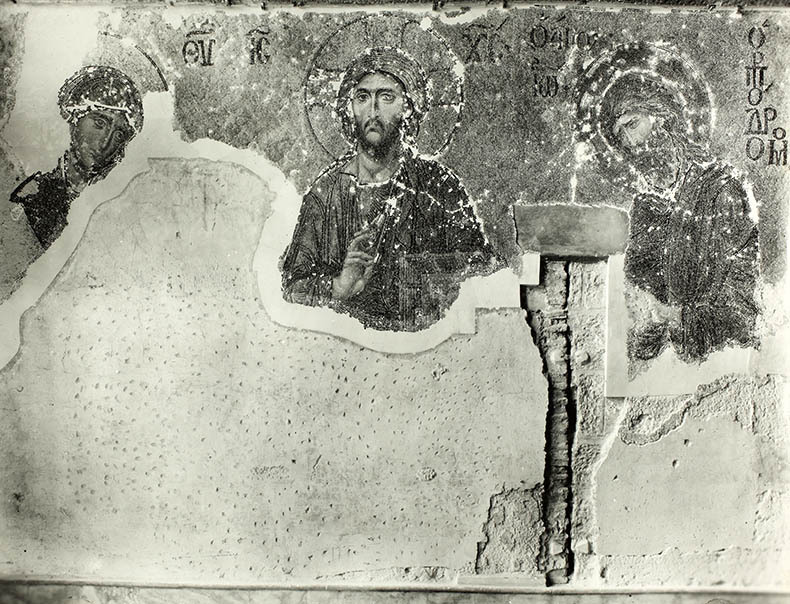 The restorers realized the importance of the preservation of this miraculous panel and did everything they could to save it for posterity and make it accessible for visitors to the new Hagia Sophia Museum, which had recently been opened. They realized that their work would not last forever, and left instructions for future generations to protect and continuously check its condition. In view of the many earthquakes in Istanbul, this was a smart recommendation. Publication of the discovery of the mosaic created a sensation in the art world. Never before had a Byzantine mosaic of this artistry been seen and the level of technique surpassed anything previously known. The mosaics went a long way towards redeeming Byzantine art in the view of art historians and public opinion, the art of Byzantium having been denigrated for centuries. The extraordinary quality of the Deesis and the stunning visual impression it made upon all who saw it, changed minds about the importance of Byzantine art, its originality and creativity. 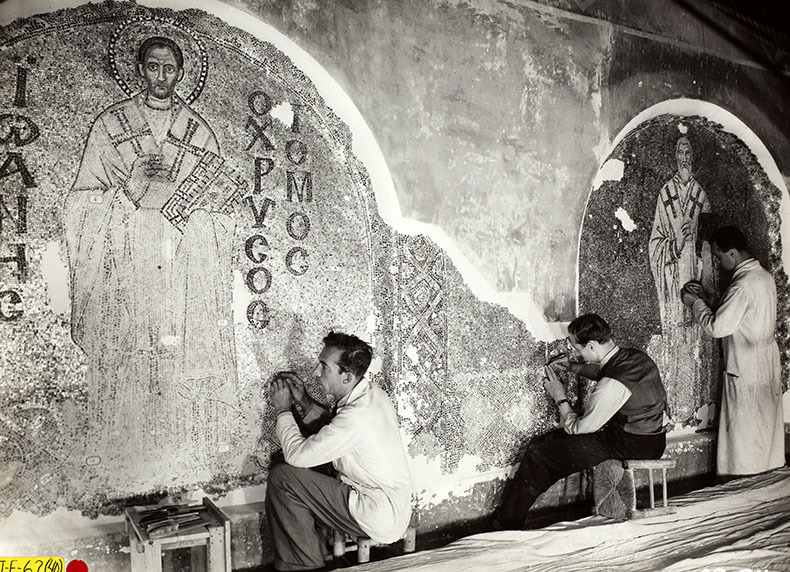 In the beginning the mosaic was known only through black and white photographs, Fortunately, amazing reproductions of the mosaics were created. The first step was the production of tracings from the mosaics. The method was simple; tracing paper was attached to a section of mosaic and an assistant copied each tessera exactly. These tracings were sent to the Massachusetts Institute of Technology to be photographed, Blueprints backed on linen were produced and sent back to Istanbul where they were then painted in egg tempera by Alwyn A. Green. These full-sized reproductions, paid for by the Robert and Mildred Bliss, among others, went on tour around the USA. One of them, the panel of John II Comnenus and Eirene, ended up at the Seattle Art Museum in Volunteer Park, where I saw it as kid hanging high up over a door to one of the halls. The copy of the Deesis was completed in 1941 and cost $7,500. 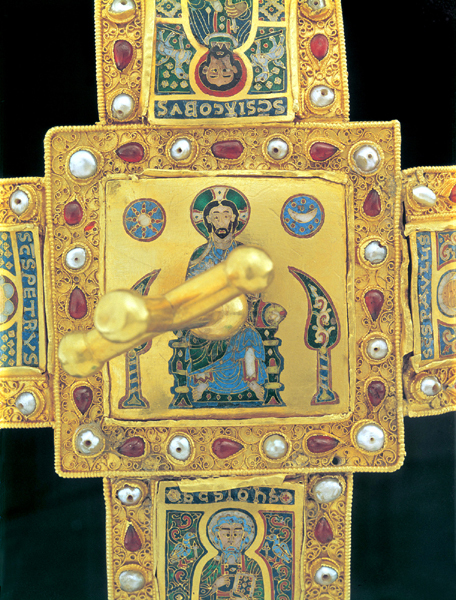 It went on permanent display in the Metropolitan Museum in New York and is still on display there in the Medieval hall, where it is seen from the same distance it would have been viewed from the lower gallery at Hagia Sophia. Castings were also made and hand-painted by George A. C. Holt of Bennington College, who invented the process and Alwyn (that's him below). 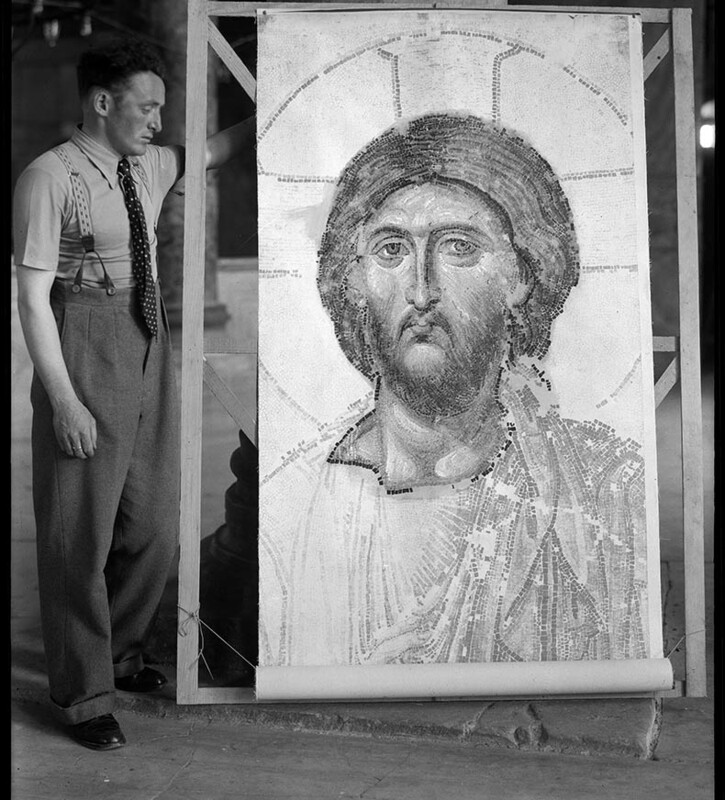 Robin Cormack tells us that Ernest Hawkins, a Byzantinist who was originally a sculptor and the author of many of the reports published in this website and was working at Hagia Sophia at this time (beginning in 1938), and Green were temperamental artists who had frequent disagreements. Alwyn and Ernest remained close for the rest of their lives. As mentioned above Alwyn did the copy of the Deesis that's in the Met. The idea was that these would go one step further than the flat painted reproductions. A mold, or squeeze, was made and shellacked. Later, when it was dry, the new mold was used to create a plaster cast reinforced with fabric that was then painted. The Met in New York purchased several of them. Above, here's one of the hand-colored tracings they made of the mosaic - this gives you an idea of the scale of the figures. 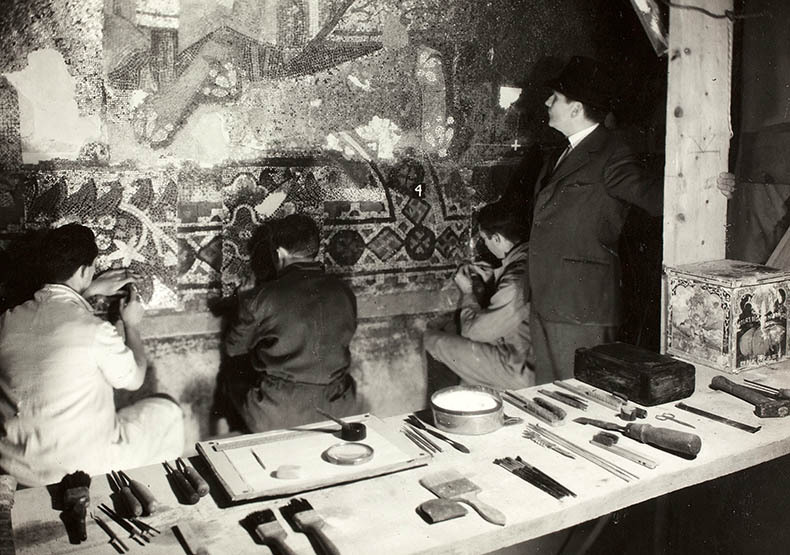 In the late 30's few people traveled to Istanbul to see the mosaics first-hand. During WWII the Deesis was covered to protect it from harm until after the war. The mosaic did not become popular and well-known until recently; thousands of tourists visit Hagia Sophia each day taking photographs and posting them places on the web. Today the Christ of the Deesis has become one of the preeminent images of Jesus in the world. 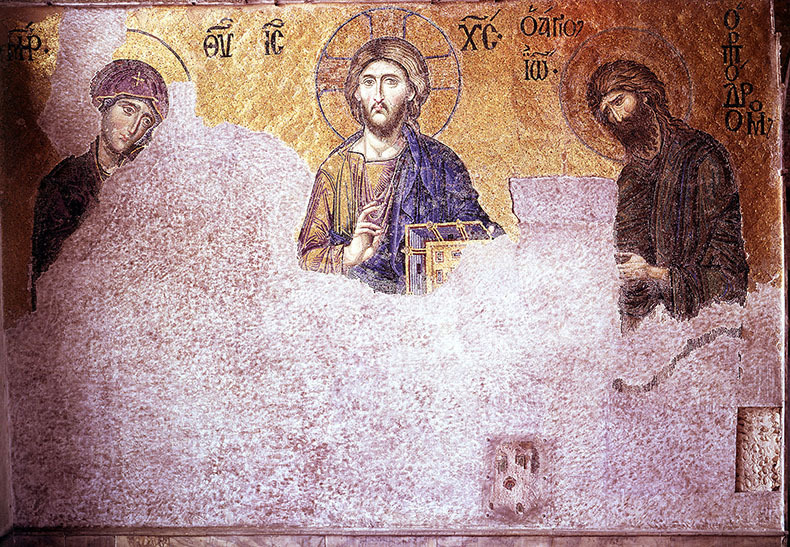 The discovery of the mosaic was a sad reminder of how much of Byzantine monumental art has been lost over time. 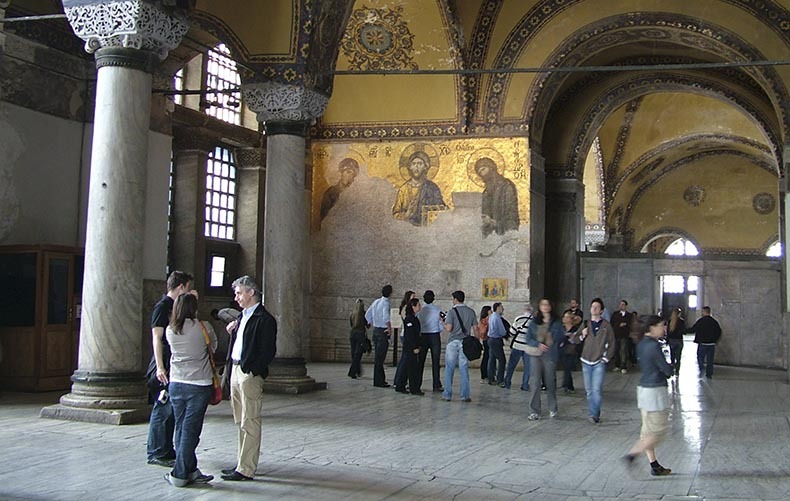 Thomas Whittemore was interviewed by magazines and newspapers around the world about the work of the Byzantine Institute in Hagia Sophia. "The method used by the Institute is worthy of description. A steel scaffold was built, thirteen meters in height and moving on swivelled wheels on a steel track. It had two sliding floors which reached to the vault of the Narthex, but which were constructed so as to avoid its transverse ribs when the scaffold moved. Both floors were enclosed in canvas, and lighted and heated with electricity from the Mosque. After the mosaic area of the vaults and walls had been thoroughly studied and photographed, two experts undertook the task of cleaning. No solvents of any kind were used in removing the paint from the mosaics. It was flaked off, tessella by tessella, by means of a small steel chisel, like those used in cleaning fossils or in scraping varnish and overpainting from pictures. The old plaster reinforcement between the cubes was not touched, as it strengthened the tessellae without spoiling the effect of the mosaics." The date of the creation of the mosaic is unknown. There are no surviving Byzantine writings that mention it and Byzantine artists usually did not sign their works - so we don't know the artist or workshop that created it. The only mosaic that has similarities to the Deesis is the small panel of Alexios that was added to the nearby mosaic of John II and his wife Irene just a few feet away. Thomas Whittemore believed the mosaic dated from the late part of the reign of John II or the first years of his successor, Manuel I Comnenus. Whittemore felt the closest dated parallel to the Deesis was Our Lady of Vladimir, a famous icon which traveled from Constantinople to Russia in this period. He saw an unmistakable connection of the style and tenderness between the face of the Virgin in the Deesis mosaic and the icon. Perhaps the Deesis is a little later, and it may have been created in the last years of Manuel's reign in the 1170's or just before the Fourth Crusade captured the city in 1204. I believe the damage to the bottom of the mosaic must have taken place during the Latin occupation when this area of Hagia Sophia was roughly used by them and was even used as the site of the burial of the Venetian Doge, Enrico Dandolo, in 1205 directly opposite from the Deesis. We know that the second row of marble panels was placed there before 1453 and the damage that took place in this area was not easy to repair. Most scholars today think the Deesis dates from after the recovery of the city by Michael VIII Palaiologos in 1261 and is some sort of victory votive panel and estimate the period around 1265 for its creation. I personally don't see a huge project like this with this level of technique being possible so soon after the recovery of the city. I cannot see how mosaic workshops could have continued during the Latin occupation, and the exiled court of Niceae did not have the funds to support an atelier such as the one that created the Deesis. The skill with which the mosaic is made is amazing. The mosaic is laid with an astonishing exactness may be seen especially in the many tiny tesserae making up the faces. A vast number of colors were used in the work and many of the tesserae are laid at angles to take advantage of raking light from the window to the left of the panel. This light transfuses the glass tesserae and seems to illuminate them from within. The panel must be the work of a team, or a mosaic atelier resident in Constantinople; the size of the work would require weeks of planning, preparation of the materials and surfaces, and then followed by the work of a team of skilled craftsmen. They cut no corners in the execution of the Deesis - even the gold background and insides of halos are set in exact and subtle patterns that are not only decorative, but make subtle use of the light in this specific location. The artisans of the Deesis had the accumulated knowledge of generations of craftsmen who had been responsible for the vast expanses of monumental mosaics in the golden vaults and domes of Constantinople. It is curious to observe the level of workmanship applied to such a large panel. The master artist was completely at home in this difficult technique using the skill of a miniaturist on a monumental scale. Considering the limited amount of time any artist has to create a section of mosaic, we can observe in awe his rapid composition and speed of execution. However, it is also possible that the faces of the three figures were created in an outside workshop and somehow later transported and mounted here in the plaster. We now believe this is how the famous portraits of Justinian and Theodora were created outside of San Vitale – probably in Constantinople - and then were sent to be mounted on the walls of the church in Ravenna, surrounded by work by lesser, provincial Byzantine craftsmen. Above you can see the restorers working on the Church Fathers in the typana. After the conquest of the city by the Ottoman Turks in 1453 and the conversion of the church into a mosque many of the mosaics of the church remained visible, even into the 18th century. It is not known when the Deesis was covered, but it may have been at the direction of an enlightened Sultan wishing to preserve the mosaic from religious zealots, since the mosaic was not destroyed. It appears most of the damage to the figure of the Virgin was most likely caused by wind and rain from the huge window to her left. For decades the elements poured through these windows which were open to the outside. However it is obvious that someone intentionally removed the gold line around the virgin's face on her cloak. 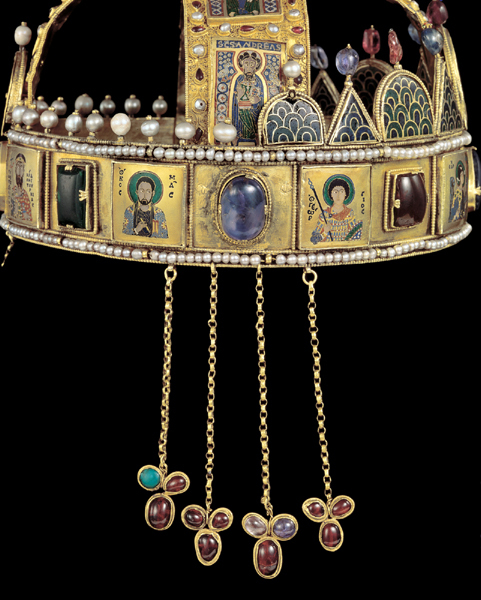 The “Corona Graeca” was a diplomatic gift of the court of Constantinople to Géza I, probably sent to Hungary with his Byzantine artistocrat fiancée. 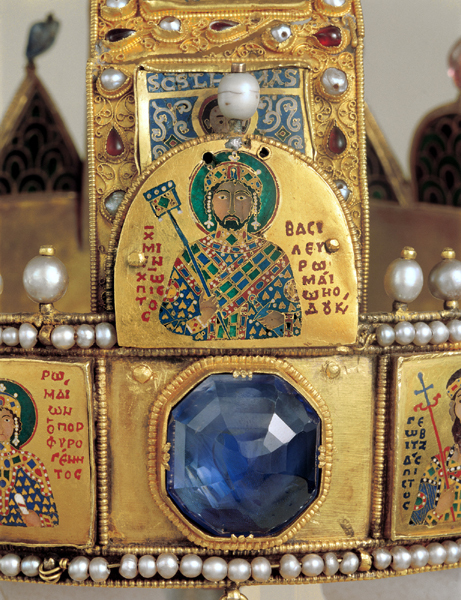 Most of the massive gems are original and would have been set in the diadem when it was made in Constantinople. 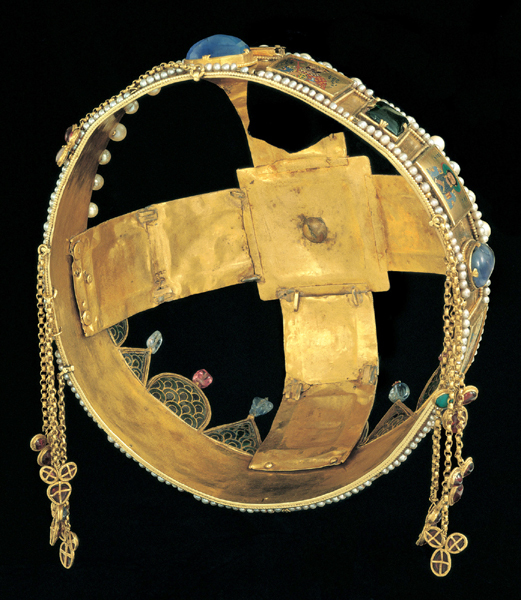 This diadem closely resembles the great crown of Byzantium. That crown can be seen in the mosaic of John II Comnenus in the South Gallery of Hagia Sophia. John's wife, Eirene, was an Hungarian Princess. The gem under Michael is a huge watery aquamarine, which is a form of beryl. When crown was dispatched from Constantinople every detail had been carefully worked out. 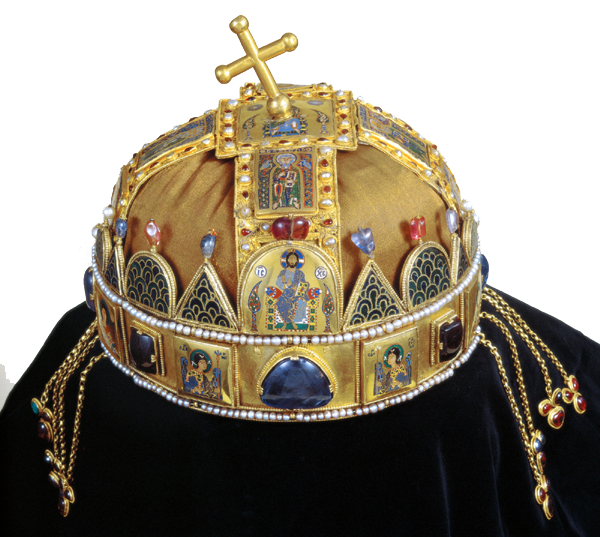 The Byzantine court sent out crowns frequently to foreign courts it favored or wanted to patronize. 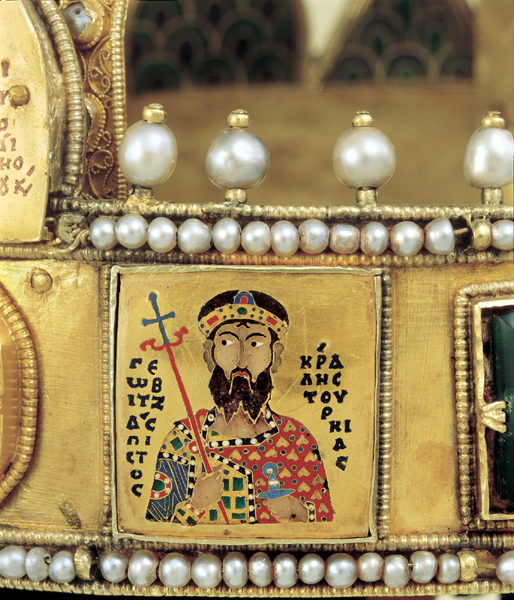 All of the foreign royalty received a Byzantine court title with it. The value of the gemstones, the pearls and the gold was carefully calculated. Certain stones were selected for their perceived spiritual or metaphysical value. Geza I, King of Hungary. His portrait is placed on the crown in strict Byzantine hierarchy, Christ is above all and the Byzantine Emperor it below Him, higher than Geza. Geza's eyes turn to look at Michael in deference to his position. 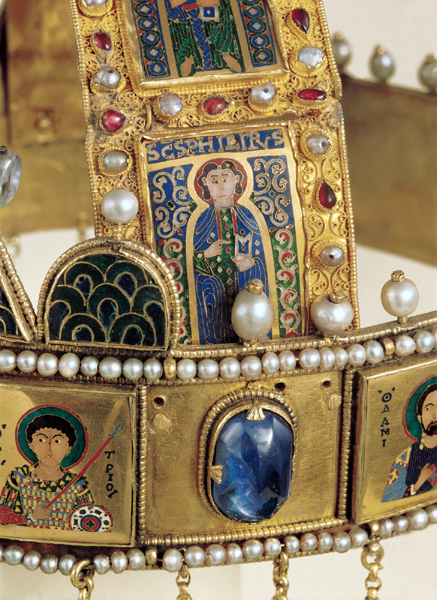 All male members of the Byzantine Imperial family wore portraits of the ruling Emperor on their own diadems or hats. A superb enamel of Christ on His Heavenly Throne - one either side are two trees in the Garden of Paradise. The gem under Christ is huge sapphire. 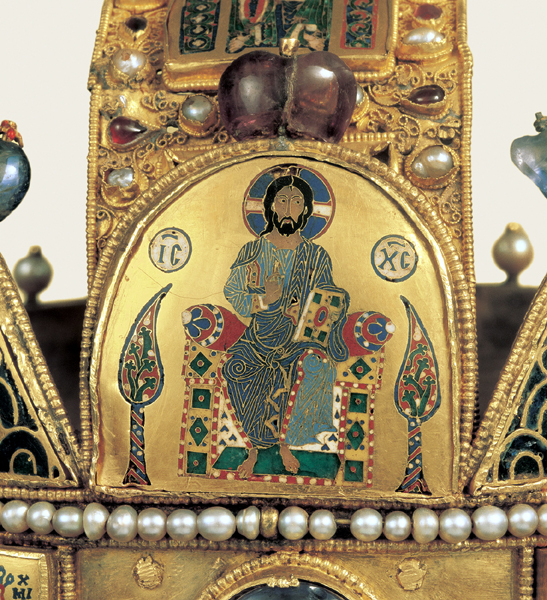 Another matching Byzantine enamel on the top of the crown. 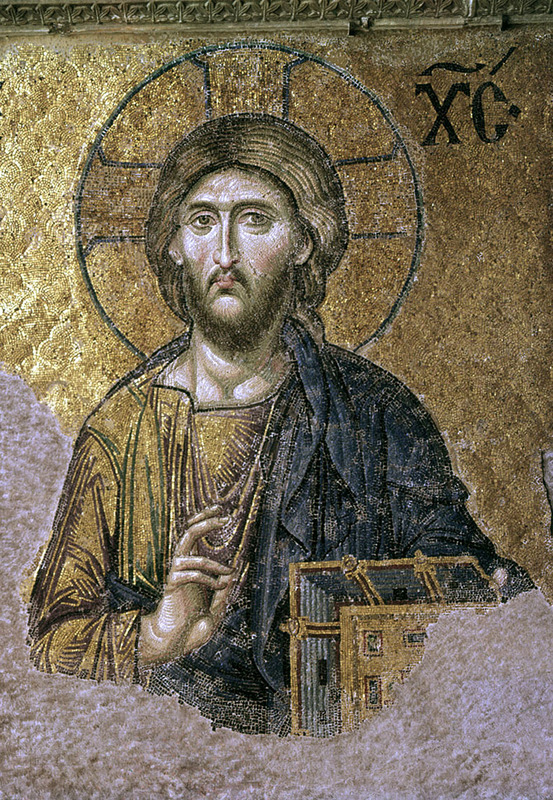 The crossed-top arm is not the Byzantine form. 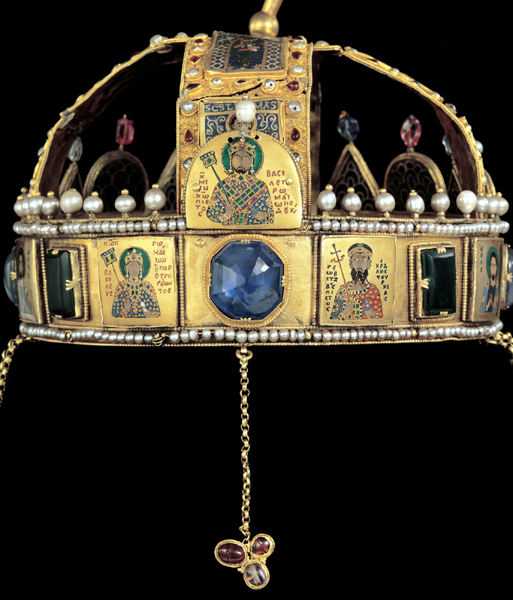 The top of a Byzantine diadem is open. The crossing was added after the diadem arrived in Hungary. 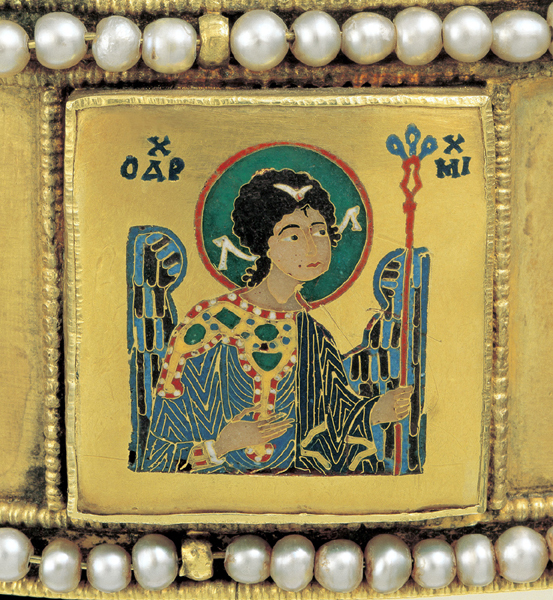 This enamel came from something else that came with the diadem. 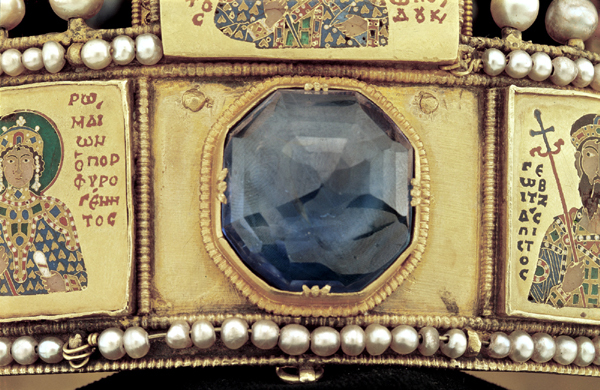 Most of the big stones of the diadem are semi-faceted. 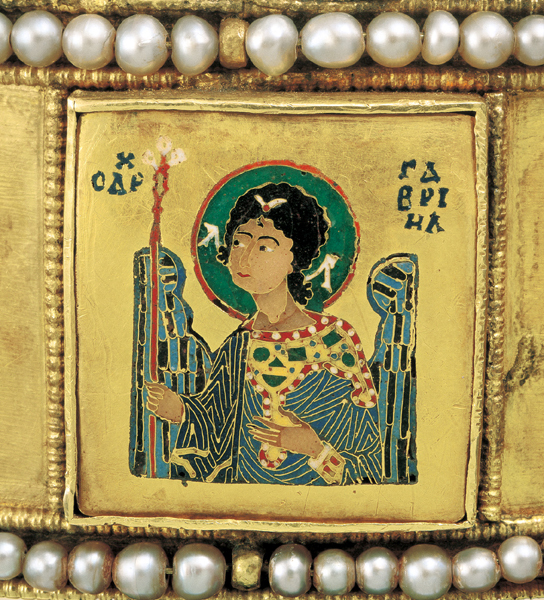 The hanging cabochon drops are customary on Byzantine diadems. They add flash and color to a man's long hair as he moves. They are made of different stones, including Garnets. Originally all of these would have been matching garnets - when some became detached and lost they were replaced with other stones.